The NFL is not Major League Baseball, the NBA or the NHL. Those leagues’ seasons drag on for months and months, with 162 regular-season games in MLB and 82 in the NBA and NHL. Because of the length of those seasons and the possibility that a team can turn its fortunes around as late as midseason, you often see coaches/managers fired during the season. The NFL, as everyone knows, is a 16-game regular season – for now, although it’s clear Roger Goodell wants to add at least one more game. Thus, it’s somewhat rare for a head coach to get the boot during the season. There simply aren’t enough games to change a team’s direction and an NFL roster is much, much larger than in any of other three major American sports leagues. It’s a bigger challenge for a new head coach to quickly motivate that many players. That’s not to say coaching turnover doesn’t happen in the NFL – it generally happens on “Black Monday,” the day after the conclusion of the regular season. But last season was unique in that three coaches were fired during the year: Jacksonville’s Jack Del Rio, Miami’s Tony Sparano and Kansas City’s Todd Haley. No one expected much from the Jags or Fins last year so those weren’t surprising, but many expected the Chiefs to be a playoff team after winning the AFC West in 2010. However, players had clearly tuned Haley out and he reportedly didn’t get along with his boss, Scott Pioli. It worked out well for Romeo Crennel. He was Kansas City’s defensive coordinator and took over on an interim basis in Week 15. The Chiefs upset the then-unbeaten Packers that week and finished 2-1 under Crennel, earning him the full-time job. Crennel, a former head coach in Cleveland, will be one of seven new NFL head coaches this season, joining Jeff Fisher (Rams), Greg Schiano (Bucs), Joe Philbin (Dolphins), Chuck Pagano (Colts), Mike Mularkey (Jags) and Dennis Allen (Raiders). There will be multiple coaches fired in the NFL this season, whether it’s during the year or immediately after. Some owner will believe he can lure the likes of Jon Gruden (who has admitted he would come back under the perfect situation) or Bill Cowher from television. With that said, Bovada has released a prop on the first NFL coach fired in 2012 – it must happen before the playoffs start. Trust me, it will. Here is a look at each candidate. 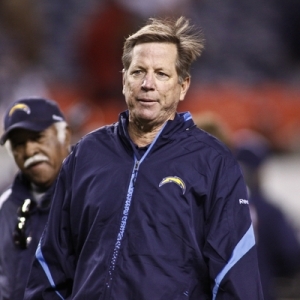 Norv Turner, Chargers (7/2): Norv is on the list every year and he’s my favorite on this prop, hands down. The Bolts have missed the playoffs the past two seasons despite having one of the most talented teams in the AFC. And San Diego generally starts slowly under Turner, last year excluded. If the Chargers lose their opener at Oakland on Monday night and then fall on a short week vs. Tennessee a week from Sunday (both quite possible, especially if Ryan Mathews doesn’t play), the Norv Watch is on. Pat Shurmur, Browns (4/1): Will the Browns stink? No doubt. But Mike Holmgren will give Shurmur at least a few years, especially with Cleveland starting rookies at quarterback (Brandon Weeden) and running back (Trent Richardson). Lovie Smith, Bears (6/1): I don’t see Lovie in any trouble as he essentially had a say in the Bears hiring GM Phil Emery to replace Jerry Angelo. However, Smith does have just this year remaining on his contract and GMs often want to hire their own coaches. But I expect the Bears to have a good season and think Smith is safe. Andy Reid (7/1): He is the longest-tenured coach in the NFL and I have zero doubt that the Eagles make a change after the season if they underachieve as in 2011. Owner Jeffery Lurie already has put the pressure on Reid, saying he has to see “substantial improvement” in 2012 for Reid to keep his job. Lurie added that he won’t decide on an extension for Reid, who has a contract through 2013, until after the season. But I expect the Iggles to be a good team and don’t see Reid as the first coach fired even if they struggle.